If the colors were changed Zimmerman would already be in prison for life. Robert Zimmerman Sr. sees conspiracies against his son and the face of the conspiracy is a Black one. Pretty much everybody but The Harlem Globetrotters is gunning for Boy George Zimmerman. The old man also claims the Boston bombings could have been averted if the FBI wasn’t busy investigating the Martin murder. The positive reviews on Amazon praising Zimmerman Sr., are just as eye-opening. This book gives you a glimpse into what actually happened in February of 2012, without the lies and politics. Don’t be put off by other people who disparage this man and his family without bothering to find out what actually happened. 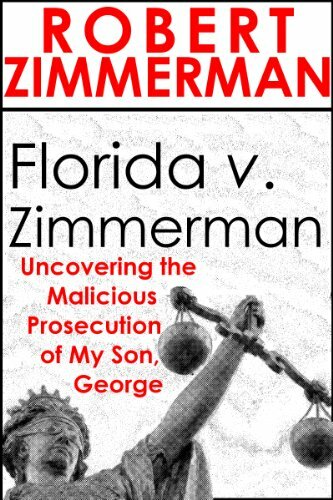 The truth will come out during the trial, and the Zimmermans will be vindicated. I have believed all along that this case was a travesty propelled by financial and personal gain by those whose interest is benefited from this being a criminal & race issue…Those of you that think this isn’t financially motivated read the book and then ask Trayvons grieving mother when & where she got those huge multi carat diamond earrings she was sporting on her media campaign? To the Zimmerman family, I support your family, and I wish the Martin family would have recognized the signs for their son to get help. It’s a tragedy, and I wish we could bring Trayvon back, and have given him some guidance before he decided not to stop beating your son’s head into the pavement. A couple more poundings, and George would possibly have brain damage, and been a vegetable. If Trayvon would have kept his hands to himself, he still would be here for his family. Okay, you get the picture. There’s a lot of sick, twisted bastards and far too many of them have computer access. Too bad you can’t train a puppy on an e-book. The only ones who could be interested in slanted, self-serving trash like this are the same fools who are making contributions to George Zimmerman’s defense fund. It’s a neat little Jedi mind trick Daddy Z has pulled off here. He appeals to racists by denouncing every African-American who has chosen justice for Trayvon over freedom for George as the real racists. This strategy should do well with morons and Stormfront members. Zimmerman, Sr.is engaged in two of the oldest defenses in the world: deflection and projection. Blaming others for the sins of racism that he and his family perpetuates continually and repeatedly. Can I say with 100 percent certainty George Zimmerman was motivated by racism when he murdered Trayvon Martin? No. But what I can say is if he is he got it honestly. Today is Father’s Day and there is no doubt Robert Zimmerman Sr., loves his son George very much . He loves him so much he would lie for him. He loves him so much he would spread his race-baiting venom to others to feed the seething racial resentment his son started with his reckless and criminal behavior . George is a killer and that reflects poorly upon how the elder Zimmerman raised him. His love is no excuse for being a lousy parent. The stupid and selfish actions of George took Trayvon away from his father and that’s why he’s on trial for murder, not because of anything the NAACP or the NBA did. Today is Father’s Day and Robert Zimmerman Sr. shows his love by spewing hate. This is the face of a good boy. Not a boy killer. Okay, I looked at the book on Amazon. It’s unreadable. It’s selling copies though. Half the reviews are five star and half are one star, which means people love it (racists) or hate it (the rest of us). It is too bad it’s only available in e-format. It would come in handy as a fire starter. My husband often uses advertising circulars to start his barbecue. That and toilet paper are about the only things this book is good for. Who is thinking about Trayvon’s dad today? Zimmerman ,Sr.is the scum of the earth. Well done analysis. Loving your child unfortunately all to often blinds one to their poor choses. In this case though, well the apple simply didn’t fall to far from the tree.